From tree to table, Washington and Oregon’s pear growers and shippers demonstrate their dedication to producing the finest quality fruit. They cultivate, harvest, store, and pack pears using state-of-the-art pre-and post-harvest practices, all to ensure the pear is at its peak flavor once it reaches the consumer. 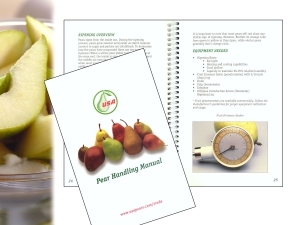 Pear Bureau Northwest developed the USA Pears Handling Manual to support and educate organizations involved in storing, conditioning, displaying, or merchandising pears. The key to having pears at the desired condition for retail display is based on holding temperatures over the life of the pears once they are harvested, the relative humidity the pears are exposed to throughout their post-harvest life, and their exposure to ethylene. Like any produce, USA Pears should be handled carefully and the cold chain maintained. Upon arrival at the warehouse, pears should be promptly moved from the loading dock and placed under refrig-eration to hold and/or slow further pear ripening. Ethylene is a naturally occurring hormone generated by many fruits including pears, apples, bananas, and tomatoes. Since ethylene can trigger and speed a fruit’s ripening process, it is best to avoid long-term storage next to high ethylene-producing fruits such as avocados and bananas if pear ripening is not desired. To check firmness, a force gauge, or penetrometer, is used to measure the pounds of force it takes for a rounded plunger to penetrate a peeled section of the pear. Penetrometers have two sizes of tips. For pears, you will use the smaller, 8mm tip to ensure an accurate reading. Remove a thin layer of skin using a knife, potato peeler, or other scraping tool. Make three thin cuts about the size of a finger print, removing the skin on three sides of the midsection of the The cuts should be consistent. Avoid any kind of scuff mark (bruising, sunburning, etc.) on the pear as the pressure may be higher or lower and inconsistent. It is best not to test spongy or shriveled pears. Spongy fruit will give an inconsistent Also avoid rough- skinned fruit. Ethylene is a naturally occurring gas emitted by many fruits including pears, citrus, apples, bananas, and tomatoes. Since ethylene increases the ripening process, take care to avoid long term storage next to high ethylene producing fruits. Ripe pears sell faster! Consumers appreciate being able to buy pears ready-to-eat, and will increase their pear purchases because they can use them sooner. Pears are one of the few fruits harvested when fully mature, but not yet ripe. Shipping Northwest Pears in a mature but unripe state assures the highest quality product will reach produce departments without becoming overripe. Ripening pears is made easier by ordering conditioned pears from your shipper/wholesaler. For more information on the USA Pear Conditioning program, contact your Pear Bureau Regional Manager. Pears become ripe from the inside out, growing sweeter and juicier as starch reserves convert to sugar. There are two tests to check for ripeness. The stem end will yield to gentle thumb pressure when the inside is ripe. Pears that are soft around the middle are likely overripe. A more scientific method for checking ripeness is to use a fruit pressure tester. The pressure tester will indicate a pear is fully ripe when it yields to 3 to 4 pounds of pressure. A reading of 8 to 9 pounds indicates they will be ripe in 3 to 5 days. While B artlett pears change color as they ripen, most other pear varieties, like Green Anjous do not noticeably change color. 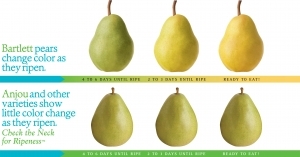 The following “Simple Pear Ripening Chart” can help illustrate the color changes in Bartletts vs. the little color change that occurs when Anjous ripen. Ripening can be done at either the wholesale or retail level. Pears need moderately warm, moist areas to ripen properly. Optimal temperature ranges from 60 to 70 degrees F (16 to 21 degrees C) with humidity near 90%. Banana or tomato-type ripening rooms are ideal. Temperatures should stay below 75 degrees F (24 degrees C), to maintain proper ripening speed and prevent breakdown of the flesh. For large quantities of fruit, the pears to be used first should be held around 70 degrees F (21 degrees C). Fruit to be used later should remain at about 60 degrees F (16 degrees C). In a retail setting, place the required number of boxes to be ripened in an area where temperatures are held at 68 to 75 degrees F (20 to 24 degrees C). Temperatures warmer than this will ripen fruit faster and unevenly. Shelf life of ripened pears depends on harvest factors, time of year, transportation and handling temperatures. Ripened pears sell faster, but they also have a shorter shelf life. Pears kept at a constant 34 to 36 degrees F (1 to 2 degrees C) will have months of shelf life. Firm fruits held at a constant 50 to 59 degrees F (10 to 15 degrees C) will last 4 to 8 weeks. Pears kept at 72 degrees F (22 degrees C) will ripen in 3 to 5 days. When pears reach their ideal firm-ripe stage, ripening can be slowed by storing them at temperatures between 32 to 45 degrees F (0 to 7 degrees C). Inspect pears daily. Your customers can ripen pears at home by placing them in a ripening bag (order these from the Pear Bureau! ), or paper bag, at room temperature. The bag acts like a mini ripening room by providing ideal humidity and temperature -bringing pears to perfect eating ripeness in no time!